When I was growing up, Passover was the holiday where I sat around a table with my family reading the story of our distant ancestors, eating strange food combinations like raw horseradish, herbs dipped in vinegar, and chanting prayers that always seemed too long. It was the week I reluctantly had to explain to all my friends why I was forgoing pizza in the cafeteria and trading Easter treats for flat tasteless matzo. Like many first generation American kids with immigrant parents, I resented being different and dreaded sticking out among my peers. But my parents insisted that we keep the tradition and commemorate our ancestors’ experience as slaves in the land of Egypt. Echoing the sentiments of the holiday, Passover was bittersweet for my family; a time to come together but also a time that reminded us that we were a long way from our home, family, and community. Unlike the rest of our relatives who resettled in Los Angeles after the Iranian revolution, my family was one of the only Persian Jewish families in Seattle. Our Iranian culture, and different traditions and language set us apart from the mostly Ashkenazi Jewish community in Seattle, and for years we tried to recreate the sense of togetherness my parents had felt in Iran, without much success. As a result, growing up I was often confused about how I related to Judaism and at times felt compelled to reject it in the same way I felt the community had rejected me. Last year was the first time I spent Passover away from home. I was in Arusha, Tanzania with my sister, who was volunteering there. My parents weren’t around to force us to observe the holiday like they always had, but our homesickness propelled us to do the unlikely: host a Seder and celebrate Passover by choice. We walked to the local market and bought leeks to take the place of the green onions that Middle Eastern Jews use in the Seder to playfully whip each other while singing Dayenu, “It would have been sufficient.” It’s an odd tradition that simulates the beating Jews suffered during enslavement and represents the importance of being thankful for your lot in life. We made Charoset, the mixture eaten to symbolize the mortar we used to build structures as slaves, with peanut butter, raisins, and cheap African wine. We searched every market high and low for matzo before finally concluding that god would understand if we used flat crackers as a substitute. 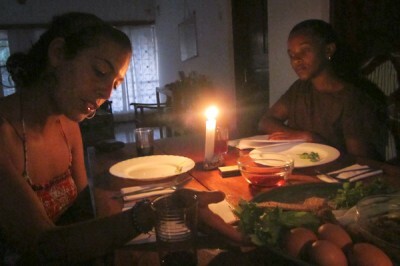 That night, after a surprise power outage, we sat around a tiny table in my sister’s volunteer house with several of her Tanzanian friends reading a piece of the Haggadah, the story of Jewish slavery, by candlelight. As our friend named Vivian read her portion she stopped and said, “I feel as if I am reading the story of my own people.” She pointed out that parallels to the story of slavery, oppression and injustice can be found across the history of her continent. Before serving the Persian dinner we had prepared for our guests, my sister and I lifted the Seder plate and chanted the traditional prayer in the ancient tune that was passed down from our grandfather, to our mother, and then onto us. As we sang I glanced over at my sister and we both chuckled at our inability to remember all the words while simultaneously, tears welled in our eyes. For the first time, we felt some ownership over this holiday. Our observation of Passover was not out of obligation but instead a feeling of connection to our family and heritage, even from thousands of miles away from home. Traveling around the world in the months before arriving in Tanzania as part of a Bonderman Fellowship I was surprised to come across Jewish communities that challenged what I’d always assumed to be mainstream Judaism. In the Mumbai airport, I spoke with an Indian man who told me about his Indian Jewish community in Mumbai and shared how they infuse their Indian culture and traditions with their Jewish practices. 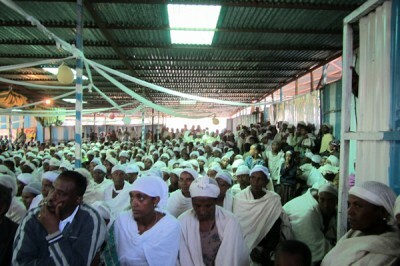 I also spent several days with a Felasha (community of Ethiopian Jews) in Gondar, Ethiopia. At a religious service held under a thatched roof in an impoverished village, I observed how Amhara traditions were fully integrated into their religious practices. They explained how they will substitute injera, an Ethiopian bread staple, for home-made matzo during the Passover days. I realized the ways my heritage inherentl y connects me to every other Jewish community around the world. I’m back home in Seattle for Passover this year, and I’ve been thinking about Vivian’s observation about the similarity between the Jewish and African experience. So I’ve decided to let go of the idea that a holiday is only significant when it’s shared with those who are of the same faith and instead use it as an opportunity to connect us to each other’s experiences. This year, my family’s Seder table will include our Iranian Muslim family friends who have embraced the holiday and seen it as an opportunity to learn more about our cultural ties as Jews; African American friends who strongly relate to the history of slavery and oppression; Filipinos who share our story of migration and struggle, and progressive Jewish friends who are excited about observing the holiday in a new way. We have adopted a social justice Haggadah that reminds us not only of the plight of the Jewish people, but of all those who, in the past and present, experience injustice. As I continue to find ways to make Passover my own, I am left with the bittersweet feeling that it represented for me as a child. Remembering the hardships of my ancestors and family and through that, finding new meanings in community and togetherness. Is Obama’s immigration policy shift really a DREAM come true? © Copyright THE TRAVELING CHAMELEON - Designed by BeatLabs, LLC.